"I'm sorry, I just assume everything you do has an ulterior motive." The Tao of Steve is a Sony Pictures Classics release directed by Jenniphr Goodman, starring Donal Logue in a Sundance Film Festival Special Jury Prize-winning performance. Logue appears as Dex, a ladies' man slacker whose approach to life recasts Eastern philosophy in the image of Steve McQueen and other manly "Steves" of the world. Ten years after college, Dex meets Syd (Greer Goodman), the woman who just might be the love of his life... if he can break free of his own highly-developed, thoroughly bed-tested formulae for romantic success. 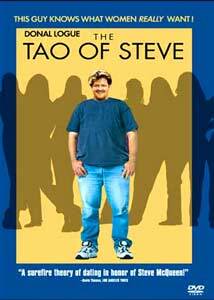 I should preface my comments on The Tao of Steve with a few words about my attempt to see it during its theatrical run. My wife and I attended a matinee showing at the local multiplex, where the sound was poor for the first several minutes. After the second reel-change, a bad splice left the film misframed, with the black interframe border running across the center of the screen. The clueless staffer summoned to fix the problem simply moved the bottom edge of the frame flush with the bottom matte edge, leaving heads cut off at the top of the frame. After a few more minutes of this, the audience left the theatre en masse to demand refunds from the multiplex manager. So we ended up seeing about half of the movie, resolving to see the remainder at home on properly-framed, digitally mastered DVD someday. I tell you this story because the experience may have colored my perception of the film as a whole. All the right stuff is in place, including a hip, pop-culture-reference-laden script by Duncan North and the Goodman sisters, a snappy credits sequence, and a recognizable world photographed with heightened greens and reds for a subtly hyperreal effect. Donal Logue is laid-back, genuine and consistently entertaining as Dex, an overgrown teenager finally coming of age, and Greer Goodman plays Syd with intelligence and restrained emotion. Director Jenniphr Goodman has a strong feel for character and timing, and several day-care center scenes just glow, with the most credible, unselfconscious kids I've ever seen in a movie. Suffice it to say that there's a great deal of talent on display here, and I look forward to future work by everyone involved. But having had some time to think about The Tao of Steve before actually seeing it in its entirety, I found my casual assumptions about the last half of the film thoroughly confirmed. The movie telegraphs its intentions at every opportunity—we get to know Dex well enough to guess where he's going before he realizes it himself, and his internal conflicts are therefore much less interesting. Jenniphr Goodman's debut feature is a promising effort, but the narrative energy exhausts itself early, leaving the viewer entertained but not enlightened. Image Transfer Review: Columbia TriStar presents The Tao of Steve in its original 1.85:1 widescreen theatrical aspect ratio, with a solid anamorphic transfer. The source print is quite clean, and the digital transfer looks just great, handling fine detail and the film's slightly exaggerated color temperature with aplomb. Nothing to complain about here. Audio Transfer Review: The Tao of Steve is presented in its original Dolby 2.0 Surround audio format. While it's unusual for such a recent film to lack a full-blown 5.1 mix, the stereo surround track is quite active, with nicely engineered panning and directionality given the limitations of the matrixed approach. Joe Delia's score benefits from decent bass and frequency range, though dialogue is occasionally overpowered by background music, and the digital transfer sounds clean throughout. Director Jenniphr Goodman, writer Duncan North, writer/star Greer Goodman and star Donal Logue contribute a good-natured running commentary that focuses more on the script and the actors than technical aspects of the production. The anecdotes are warm and generous, and the track generally sounds as though we're listening in on a group of friends. Three Donal Logue-related promos are presented here, including video trailers for The Tao of Steve and Jerry Maguire in 1.33:1 full-frame and Dolby 2.0 Surround, and the theatrical trailer for The Patriot in 1.85:1 anamorphic and Dolby Digital 5.1. Two brief bios and filmographies, covering director Jenniphr Goodman and star Donal Logue. The Tao of Steve is a fairly conventional romantic comedy, buoyed but not quite rescued by a good script and fine performances. Columbia TriStar's DVD features a fine transfer and an entertaining commentary, but the disc is best suited for rental.